Your garden is a sacred and personal sanctuary that allows you to forget about the stresses of your everyday life and the colours you choose to adorn your outdoor space should reflect your tastes. Garden design requires a great deal of effort and attention to detail, which is why you should take your time choosing the right flowers, shrubs, and trees for your front and backyard. Even commercial properties need to have a certain amount of character to them in order to attract more customers and make employees feel comfortable. Incorporating the right combination of colours and shades can help create a calming, inviting, and cohesive outdoor space, so don’t shy away from using a wide range of beautiful shades! Ultimately, the colour scheme you choose for your personal or public outdoor space all depends on what you’re hoping to accomplish. If you want to create a soothing place to retreat to for relaxation then using light purples, pinks, blues, and greens is the right way to go. These are soft pastel colours that promote a relaxing atmosphere and can help you unwind after a long day at the office or anywhere else. If your goal is to create an inviting space, then you might want to consider comingling some bright and happy yellows with bold and eye-catching colours like orange or red. One of the main aspects of professional garden care is helping clients realize their vision and that also means listening and adhering to their preferences. After all, you’re the one who’ll be using the outdoor space on a daily basis. When it comes to garden design, the main rule of thumb is typically to choose colours that are within the same family because they go well together. 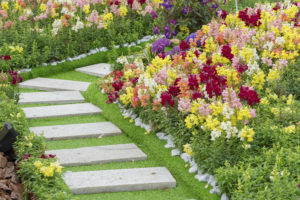 However, if you prefer to take risks rather than taking the safe route, you might want to get a little experimental with the types of plants, decorations, and colours you choose. Leave the lawn and garden care in the hands of the professionals. If you’re having a hard time deciding how to decorate your garden and what types of plants to use, then you should ask local garden designers and maintenance workers for suggestions. They can recommend manageable and beautiful solutions that are perfectly suited for your preferences and the region you live in. Aside from helping you create an ideal colour scheme for your garden, landscape experts can also advise you on the types of plants that are most likely to thrive in your region during any particular time of year as well as how to properly care for them. The gardening experts at FOREVER GREEN LAWN & LANDSCAPE INC. have been beautifying people’s outdoor spaces throughout Toronto and the GTA for more than 20 years. We have a thorough understanding of the varying climates in Ontario and can help you create an ideal garden that truly matches what you hope to achieve. Schedule a consultation with one of our lawncare experts today to learn more!